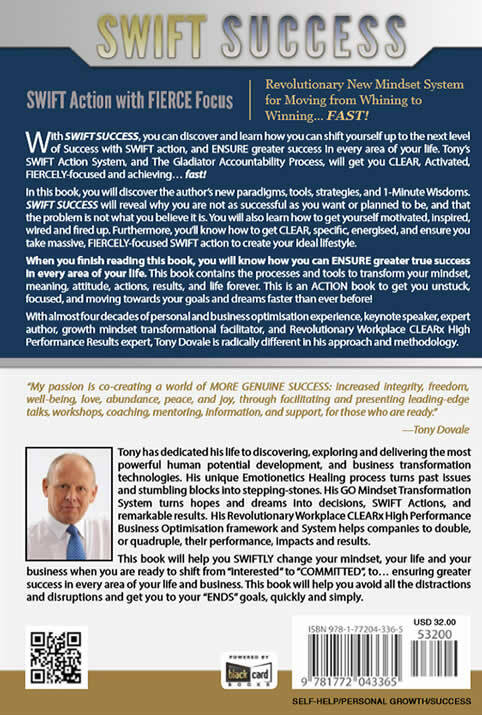 SWIFTSUCESSBOOK - Success Activators -Get a MINDSMART GO-Mindset! Revolutionary New Mindset Mastery System for Moving from Whining to WINNING...Fast! Taking SWIFT Action with Fierce Focus. 1. Actually...taking the requisite actions, consistently and incrementally. 2. The real problem occurs when you get your "success", only to discover that it has all been a waste of time and isn't what you really really wanted! Tony Dovale has invested most of his life exploring, testing, and developing, authentic strategies to ensure true success. - Show you how to ReThink success and build a winners' heart-mind-set that always succeeds. - Show you how to remove your invisible Limiting Beliefs and Negative Self-Talk forever. - Share how you can use the 4 levels of inspiration to rapidly transform your focus, actions, and meaningful results. - How you and your staff, can be 7 times more valuable than "average Joe" in your business or team. Tony shares his wisdom of Means-Goals versus Ends-Goals, and how failure is success with the right mindset. His powerful Mindset Mastery system stops the inner deception that prevents you from delivering optimal efforts and achieving exceptional results. Tony steps you through the SWIFT action creating process to ensure you create true success with greater self-worth and a new Identity, via his LifeShift Formula WON Success Ensurance System that works every time! Tony shares the secrets to the first inner-war that you must win to enjoy true success, and how to get the drive to ensure you focus and take SWIFT Action to neutralize and counteract Learned Helplessness. His wisdom includes....why making decisions can be dangerous to your success, and the importance of mindset, emotional and energetic state, because Mindset really matters. Punch Procrastination in the Chops! You will learn how to push past procrastination and rational resistance with your CORE driving passion fueled by your Soul's goals, that will ensure greater freedom, love, abundance, peace gr_inline_cards gr_run_anim Punctuation only-joy when you become your own Success Alchemist. To achieve this you must learn how to manage and protect your CORE energy and mindset; remove your hidden thought-viruses that are stealing your dreams. Learn to use the power of the potent Gladiator Accountability Protocol, that will SEAL your SWIFT Actions, and destiny,. to ensure solid success. 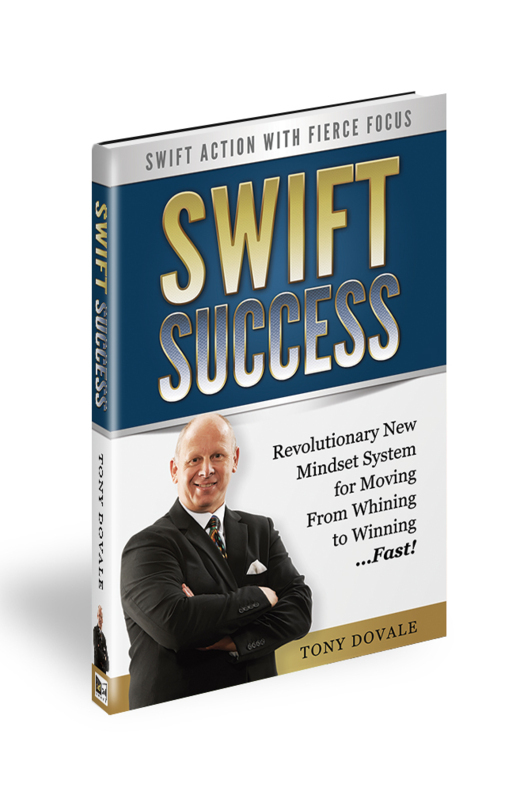 This includes Tony’s new 5 step system to activate your PURPOSE, and how to build a winner's growth mindset to RE:THINK REAL SWIFT Success, in all areas of your life. A growth-mindset that's bullet-proof, ensures FIERCE Focus, SWIFT action and true success. How to enhance your value to your business by 7 times more than others; 8.4x if you are a leader. How to beat procrastination, and take SWIFT action, to create true success in every area of life. Learn to THRIVE and FLOURISH with awe-inspiring resilience and optimism during difficult times. Increased mental awareness and greater choice, dramatically increasing your leadership abilities, options and success potential. STANDOUT by dramatically improving self-confidence, self-esteem with the Gladiator Accountability Protocol and SWIFT Action System. Radically enhance your energy, mental acuity, decision-making and focusing ability. Greater ability to make clear choices, in line with your Soul's Goals to ENSURE true success. How to permanently reduce or eliminate fear, anger, frustration, uncertainty and anxiety. Dramatically increase your overall self-confidence, self-mastery, certainty, peace, joy, and happiness. Incorporate Soul Surgery to transform mindsets, teamwork, leadership effectiveness, organisational culture for exponential actions and results. Discover & release what’s been holding you back all of your life. Free yourself from limited thinking. Tools, frameworks, and strategies, to transform and effectively develop high performance, resilient, growth mindsets. 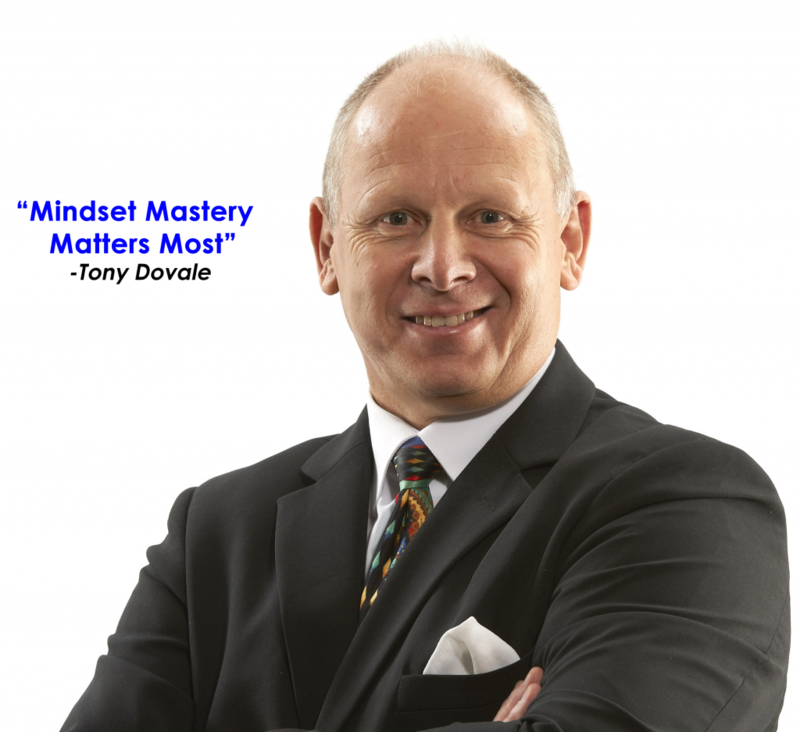 Tony Dovale, founder and CEO of Life Masters, is the Business Soul Surgeon, and the #Bullet Proof #FutureFitToday GO Mindset Guy, that enables REAL Success with his #Mind-Grow-Tainment approach; and SWIFT Action with FIERCE Focus, in a Consciously Constructive, Revolutionary, High-Performance Workplace. Tony helps people and companies to achieve exponential impacts and results in a human positive manner that supports People, Planet AND Profits. 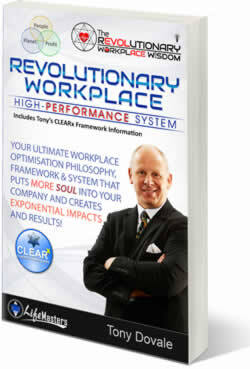 Tony's personal transformation (LifeShift) and #FutureFitToday Revolutionary Workplace, High-Performance systems (HPO); CLEARx, activate, expands, and aligns, the best and fullest potential in People, Teams, Leadership, and Culture. His proven HPO framework and approach helps in the new #FutureFitToday, Consciously Constructive, Organisations, where resilience, relationships, courage, responsiveness, and agility, prevail to create 10xponential impacts and results. Tony’s #FutureFit Mind-Grow-Tainment, and Team-Flow-Grow approaches are strengths-based, appreciative, experiential, and action-learning, focused to achieve deepest impacts on human consciousness. He fuses real-life experiences, Neuro-science, and powerful stories together, to take you and your people, teams & conscious leadership to the next-level of potential and possibility, in life and business. He has inspired, audiences across the globe: London UK, Salt Lake City USA, Nigeria, Kenya, Zambia, Zimbabwe, South Africa, Toronto Canada, Namibia and Manchester UK. Tony is an expert in Resilience, Courageous Growth Mindsets, Psychological Capital development, and High Performance systems, that puts #PeopleFirst in a VUCA and ever more digital-artificial intelligent world. 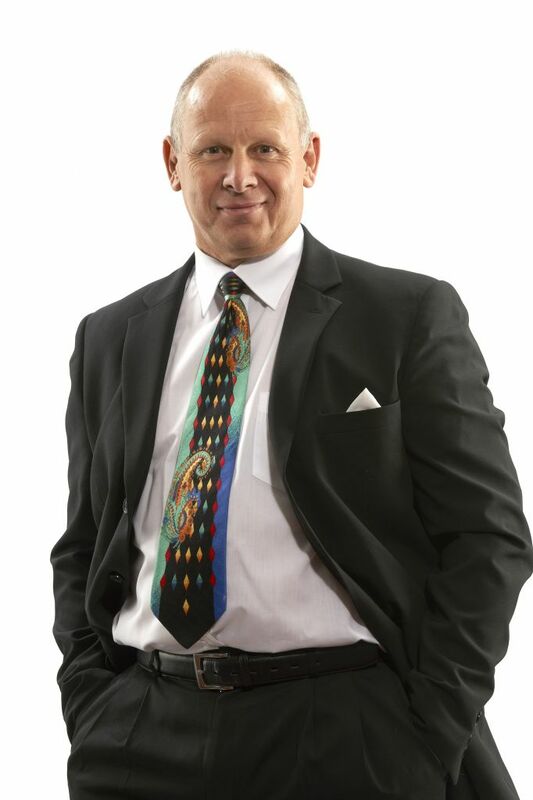 He is a globally certified facilitator of the Science of Happiness@work(tm), and a specialist in applying leading-edge technologies, tools, and frameworks, like Consciously Constructive, Revolutionary Workplace CLEARx, Appreciative Inquiry, Emotionetics and Neuroscience, to energise, optimise and achieve exponential impacts and results. Words of Wisdom to shift your Soul to higher awareness, consciousness, and choice. Let more light out.. Time to Shine Brighter. High-Performance workplace model to be #FutureFuit in a VUCA World. Optimising People, Teams, Leadership and Culture to achieve 10xponential impacts. 1. 6 CD Set: Optimise and balance your 6 core ares to ensure a more successful life. 2. 14 CD set: Personal Transformation tools to turbo-charge performance & results. This is a very unique an impressive book on success. I like it! Tony Dovale has provided a fabulous resource that can make you victorious in life…superfast! It is fun and easy to read. It addresses and solves big problems that keep people from success. He gives simple, easy to understand advice that is not taught anywhere else! This book is full of amazing, innovative insights and brilliant wisdom that impact people's lives, families and their business. As a savvy businessman and an expert in leadership Tony brings a wealth of experience, tools, stories and strategies to ensure that change happens and growth happens in your life…..and continues. With this book you will be able to “throw out the mental trash” that has been getting in your way and then replace it with pristine principles that always work. As an internatonally recognized success expert I can conﬁdently say that Tony has done a great job in explaining how to make success a reality in any area of life that matters to you. Read it NOW! At a time when everyone is being bombarded with useless messages, Tony’s book provides wonderful perspectives and powerful tools for each of us to achieve real success and happiness. Tony challenges and inspires the readers by sharing his personal experiences and wisdom, which combined with his Success Activator Purpose system, provides the deep internal push we all need to create a different, and more meaningful life. “I never expected to get out what I did. EVERYBODY in business should do this course. I call it Lifeline!!! Tony is amazing. I wouldn’t trade anything in the world for what he taught me! Tony's workshop and coaching was life-changing for us and staff, and life-giving for our entire company!